The Ohio attorney general handed over a $100,000 check to Pike County officials Thursday to help cover the costs of prosecuting the suspects accused of killing eight people there, and said more money will be coming. 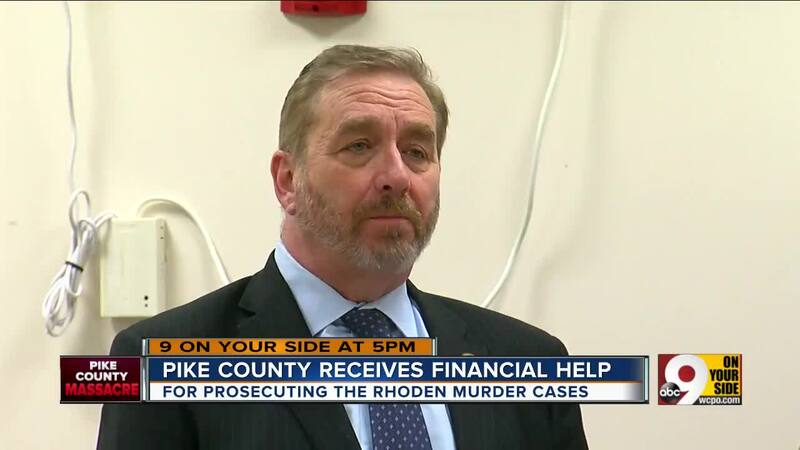 WAVERLY, Ohio — The Ohio attorney general handed over a $100,000 check to Pike County officials Thursday to help cover the costs of prosecuting the suspects accused of killing eight people there, and said more money will be coming. Attorney General Dave Yost, Pike County commissioners, state legislators and Pike County Prosecutor Rob Junk met for a roundtable discussion on funding the trials of four members of the Wagner family accused of killing eight members of the Rhoden family in April 2016, as well as two others accused of helping cover up the crimes. Pike County Commissioner Tony Montgomery said the county has spent about $600,000 so far in the past few months on this case alone. That figure includes sheriff's office overtime, securing evidence and transporting the suspects from jails outside the county. They have been reimbursed $132,000 from the state so far, on top of the $100,000 check given Thursday. Pike County is a small county with a limited budget, according to Junk, the prosecutor. "I want to publicly thank everyone for this $100,000 down payment on the Wagner cases," he said. "It will help." The ongoing trials could cost millions, officials said. Yost said the check given Thursday was just a "down payment from the state" to finance the trials. It will ultimately be up to Ohio lawmakers to decide how much the state will pay for the trials, but Yost said he believes the state should be responsible for funding them. "The state has an interest in justice in these cases," he said. A bill before the state legislature would — if passed — allow the state to help counties that have two or more death penalty murder cases, since those are the most expensive cases to try. One other cost is the result of a court order that all four suspects not wear handcuffs in the courtroom in the future. The sheriff’s office wants to buy a used “stun-vest” to restrain them at a cost cost of $540. Sheriff Charles Reader wasn’t invited to the check presentation Thursday. A reporter caught up with him at work. “Mr. Montgomery and the commissioners don’t have to approve what I already have appropriated in my budget,” he said. He says county commissioners denied his request for extra money to buy the shock vest. Since there isn’t much money to go around, there’s no guarantee the sheriff’s office will get a refund despite money from the state.